Business Ethics Blog It's Not Easy: Ethics is Not for Wimps. It’s Not Easy: Ethics is Not for Wimps. Character is not a gift; it’s an achievement. Let’s be honest. Ethics is not for wimps. It’s not easy being a good person. It’s not easy to be honest when it might be costly, to play fair when others cheat or to keep inconvenient premises. It’s not easy to stand up for our beliefs and still respect differing viewpoints. It’s not easy to really feel genuine remorse and apologize sincerely, or to accept an apology graciously and truly forgive. It’s not easy to bear criticism and learn from it without getting angry, to take advice, or to admit error. It’s not easy to stop feeling like a victim, to resist cynicism, and to make the best of every situation. It’s not easy to be consistently kind, to think of others first, to judge generously, to give the benefit of the doubt. It’s not easy to be grateful or to give without concern for reward or gratitude. It’s not easy to fail and still keep trying, to learn from failure, to risk failing again, to start over, to lose with grace, or to be glad for the success of another. It’s not easy to avoid excuses and rationalizations or to resist temptations. 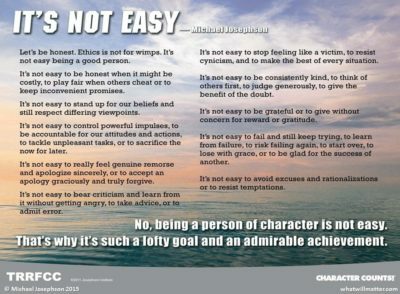 No, being a person of character is not easy. That’s why it’s such a lofty goal and an admirable achievement. With our son entering 7 th grade, my wife growing her research career and myself struggling to GROW our service based professional enterprise WE are all very blessed with an amazing ability to SERVE others!! Thank you Michael for the “committed” leadership in Character education over the years. Lifting UP one’s “COMMITTMENT” is my daughter Kelsey’s big 6 year lesson from UCLA (Master Ed.) which you have so effectively modeled !! !